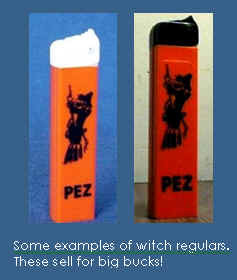 One of the very earliest Pez candy dispensers produced was what is now called a witch regular. This Pez dispenser featured a silk screened picture of a witch flying on a broom on each side of the dispenser stem and did not have a character head. Made sometime in 1956, it is the first Pez known to have any reference to Halloween and appears to be extremely rare. Later, in 1957, the Pez Company produced the first Halloween character head dispenser that we now call Witch A. This is a footless Pez dispenser with a very detailed witch character head that also featured an embossed figure of a witch on one side of the dispenser. A variation of this dispenser, Witch B, came into production shortly after and is regarded as the scarcest of the two varieties. Witch, along with three new Halloween characters: Mr. Ugly, One Eyed Monster, and Octopus. These are very popular with collectors today and all can be found in numerous color variations. The early 70’s also included in the Halloween mix of characters the Pez Pal Pirate and Gorilla. In 1972 the skull character (Skull A) was added to the Halloween assortment. 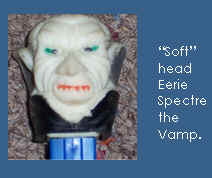 A second series of monsters and ghouls was issued in 1979 with a new “soft” head. These are known as Eerie Spectres and include Airspirit, Diabolic, Scarewolf, Spook, Vamp, and Zombie. 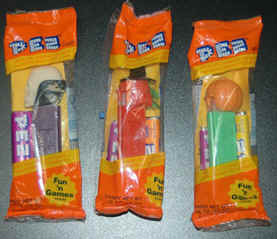 These Pez were quite unique in that the heads were soft rubber and fit on to a plastic adaptor that finally attached to the dispenser stem. All were very limited in production and not manufactured for very long. along with a non-glowing revised pumpkin, Pumpkin C or large head pumpkin, for the U.S. market. Also in that year the U.S. Pez Company offered, by mail order only, crystal variations of the ghosts and color variations of Skull B and Witch D (called misfits). In 1999 Witch D was made available in a crystal version, and became part of a trend that provided many variations of current Pez using different plastic parts and colors. Also in 1999 the Halloween ghosts were released for general retail sales in the U.S. , but as non-glowing versions. Then in 2002 the Pez glowing ghosts became available in U.S. stores. However, the pumpkin had a GITD stem rather than a glowing head like Polly Pumpkin. The current Halloween Pez series, introduced in 2003, consists of a new revised witch, pumpkin, skull, and introduced a new mummy character. All feature GITD stems or heads. This Web Page is a Collector hobby site, and is neither endorsed by nor affiliated with Pez® Candy, Inc. Pez® is a registered trademark of Pez® Candy, Inc.; Orange , Connecticut .